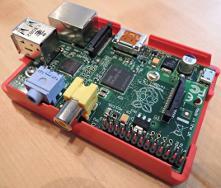 I think that most readers will already know what a Raspberry Pi is, and have heard at least a little bit about it. But in case you haven't, it's basically a tiny, single-board computer. See wikipedia or raspberrypi.org for more information if you haven't seen one already. This section will deal with the Model B of the Raspberry Pi, which was at the time of writing the newest and best model available. Since then, there was an update to the B+, a smaller and cheaper model A+, and now there's a faster version 2. But much of the detail here will still be valid for the other models. As you can see in this picture, it looks like a basic circuit board, with a few sockets on the top, but it's actually a real computer. It is only about the size of a pack of playing cards (actually a little bit bigger and a bit thicker due to the sockets) but it can run a real linux system, and use a real monitor, keyboard and mouse. It's got an ARM processor, which is more like the processor in a mobile phone than the one in your computer, but still, it's capable of running many things that a netbook can. And it's really cheap, around 35 Euros for the basic board. You can see a picture of this model B, with the most important features labelled, on the basics page. It's such a multi-purpose computer, you can do many many different things with it. Some people may just use it to run linux things, and not care about the electronics. Some other people may just want to use it as an XBMC client for the television, and not care that it's running linux. There are some pages about those kind of applications, including getting to grips with Raspbian, OpenElec and Noobs, at linux.activityworkshop.net. But here we're in the electronics section of the ActivityWorkshop, so we'll have a look at those interesting looking pins in the lower corner of that photograph, and see what we can connect them to. Plug some simple LEDs into the GPIO pins and play with lighting them up using Python. Here's a gentle introduction, learning something new and getting some easy results. Build up to some slightly more complex electronics with demultiplexer chips and shift registers to drive more LEDs and multi-digit displays. Make the "Steady Hand" buzzer game described in issue 5 of MagPi magazine. The first really useful project. Add a 3-axis accelerometer to make a simple games controller with a stick and a bit of wire. Try out a 3D gesture sensor called a Skywriter, which can measure finger position in 3D. Page last updated February 2016. Feedback welcome at mail@activityworkshop.net.